Shri Shantadurga Temple is on slopes of foothills of a mountain chain, surrounded by lush vegetation of Kavalem village in Ponda. It is one of the oldest temple in the area. There is a main temple and three smaller temples of other deities on three sides of the main temple. The main temple structure was built during the period 1738 A.D. It was constructed during the reign of Maratha ruler Chattrapati Shahu of Satara. 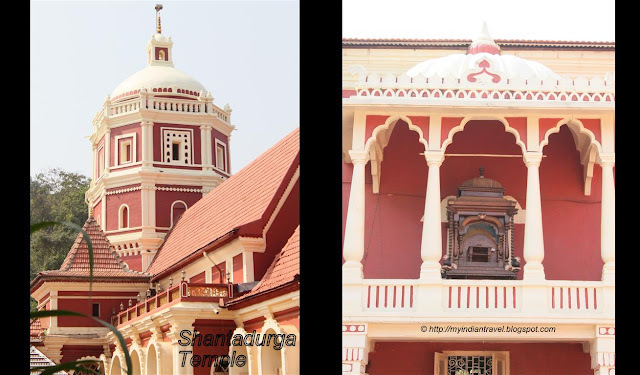 The temple is dedicated to Goddess Shantadurga. The temple has several pyramidal roofs with a dome. The pillars and floors are made of Kashmir stone. Temple also has roman-arched windows, some of which have the stained-glass window panes of deep red, yellow, blue colours. In front of the main temple there is a light tower. The temple also has a huge tank in the front. What a beautiful temple, and it looks so well kept. 1738 would be an ancient building here in the US -- but for you it is rather modern! Beautiful temple! Nice captures of the temple. This temple looks quite modern compared to others which you have shared with us and very well maintained. I wonder what the purpose of the water tank is? Gosh another week of such exquisite detail Rajesh, I love the warmth of colour of the temple, just drawing you in. Beautiful colours and architecture....I like the light tower! Colorful temple exteriors and well composed pics! beautiful and divine. i have been to this temple in Goa. It is beautiful! Great photos. A beautiful scenery, and the reflection is amazing!